Trojans’ Bryce Wallace celebrates after he returned the Valley onside kick for a touchdown in the final minutes of Thursday night’s contest. Indians head coach Darren Crabtree gives senior quarterback Andrew Shope guidance on the sidelines Thursday night. The first game of the 2018 season in Scioto County lived up to the hype of the waiting during the offseason. 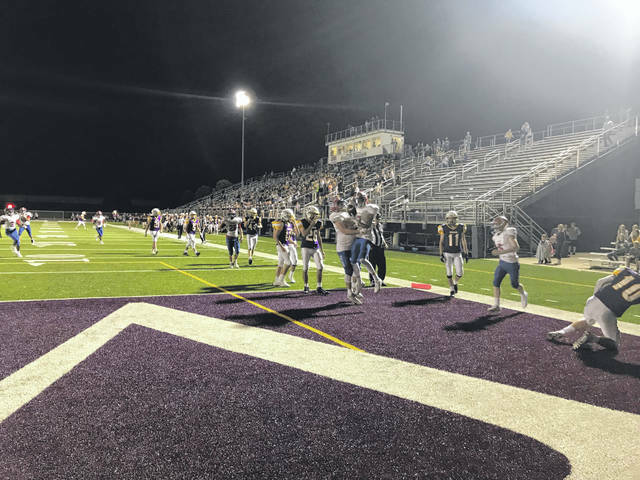 Both teams made explosive plays in all three phases of the game that were crucial in the deciding result of Thursday night’s contest. The game began with a methodical drive down the field by the Trojans in the game’s first possession. Just as it looked that junior running back Talyn Parker would get his first rushing touchdown of the season on a short carry, Indians sophomore Andrew Andronis came out of nowhere to recover a fumble for a 99 yard touchdown that quickly shifted momentum in Valley’s favor and gave them the lead 7-0 in the early stages. This shift would not last long, however. The very next drive, Parker picked up a 49 yard rush that took his team to the five yard line before senior quarterback Danny Lattimore took the ball into the end zone for his first rushing touchdown of the game. The Trojans defense would force the Indians to punt on Valley’s first offensive possession of the game, setting up Parker’s first rushing touchdown of the game from 21 yards out. The Trojans would complete the two point conversion attempt after the snap on the XP was fumbled, forcing Lattimore to scramble and find a Trojan receiver in the end zone to give his team a 15-7 lead early in the second quarter. Portsmouth’s offensive efficiency would not deter Valley’s resiliency to remain close in the game. Kayden Mollette’s one yard rushing touchdown just minutes after Parker’s brought the score to 15-14 early in the second quarter. The Indians refused to quit on the offensive side of the ball. A 36 yard touchdown pass over the head of a Trojan defender from senior quarterback Andrew Shope to senior Tanner Spradlin tied the game at 22-22 after Valley’s 2 point conversion attempt was successful. In the closing seconds of the first half, Lattimore lead his team down the field and punched the ball in himself for his second rushing touchdown, giving Portsmouth the 29-22 lead heading to the locker room. That did not stop him from rushing for over a hundred yards in the second half as he finished the game with 31 carries 324 yards and four touchdowns in the first game of his junior season. The first score of the second half would come on another Parker carry for a six yard touchdown, giving the Trojans the 36-22 lead after their defense was able to deny the Indians a chance to score on the other end. Just as they had all game, Valley found a way to strike back at Portsmouth’s high powered rushing attack. Shope found Mollette for a nine yard touchdown strike that was set up by a 40 yard rush by Mollette and a nineteen yard scramble by Shope. The Indians brought the score to a one possession game after their missed XP at 36-28. Portsmouth’s next offensive possession would be stopped short of their goal and would result in a turnover on downs. Valley would not waste time in their attempt to tie the game. Shope would find Spradlin on a 51 yard touchdown pass making it a two point game at 36-34 before the Indians two point conversion attempt would prove to be unsuccessful. Feeling the pressure from the Indians comeback attempt, Trojan running back Ty Pendleton took matters into his own hands by following his lead blockers on the way to a 41 yard touchdown rush, extending the Trojan lead to 43-34. Forced to go for a fourth down attempt on their own half of the field because of the time left on the clock and it being a two score game, the Indians were stopped short of the first down line. The very next play saw Parker break off a 38 yard touchdown rush, his fourth of the game, giving Portsmouth the 50-34 lead after the XP was successful. 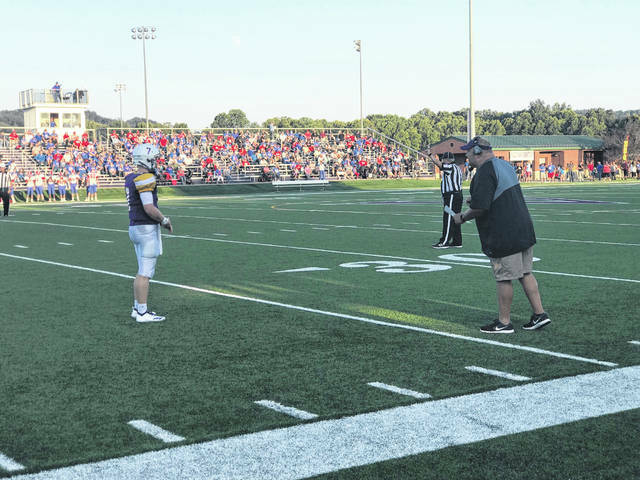 Valley still showed incredible fight in the final stages of the game as Shope found Spradlin in the end zone for the third time on five receptions, but the necessary two point conversion attempt was unsuccessful, sealing the game in favor of the Trojans. For good measure, Bryce Wallace returned the Indians onside kick attempt for a touchdown in the game’s last touchdown, bringing the final score to 57-40 in favor of the Trojans. The Indians will host the Coal Grove Hornets next Friday night in Lucasville in their second game of the year.